Adrian Hewitt, from Merton, was the first interviewee for this research. When we met back in September 2006 the research methodology was just evolving. Since then Adrian has participated in all the different stages of the Learning History research including, for this History, an extensive cylce of 'perspective gathering' from others actors involved in the Merton Rule. At the workshop stage, Adrian, like other protagonists present, could see people working with the story he had told. 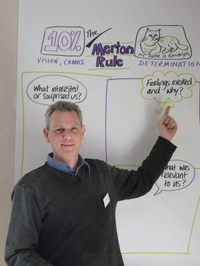 Adrian Hewitt - Pictured against Chris Seely's graphical poster of Merton that includes a cartoon of his cat Randolph! At the workshop I had the opportunity to ask Adrian how, after 18 months, he reflected on his participation in this research. Click on the audio button below to hear me pose this question to Adrian and to hear his response. ".....The value for me is to see someone taking an interest at an academic level in the story rather than just in the outcomes of the Merton Rule at a technical level..."
In the audio clip, Adrian goes on to talk, among other things, about the value in making comparisons with other protagonists from other Learning Histories - in particular Steve from the Nottingham Declaration who was also attending. As Leader of Merton Council at the time we introduced the 'Merton Rule', I can say that full credit should go to council officers like Nick Smart, who devised the rule, Adrian Hewitt who took up the cause with enthusiasm and very strong networking skills as well as the then Director of Environment and Regeneration, Richard Rawes, who gave this innovative and controversial planning policy full support. However, there was also an important political dimension, which is usually left out of account, not least because the administration of Merton Council has since changed to Conservative and it is not in the interests of the current council to recognise the contribution of the previous Labour administration. As Leader of Merton Council from 2001, I was insistent on two things: first that council officers must be free to innovate and take risks to attain improvement without feeling that councillors would always be breathing down their necks and second that Merton must aspire to be a 'cutting edge' environmental authority. In this context, I asked whether we could insist on developments including renewable energy. When the Merton Rule was first proposed, as Leader I supported its introduction throughout and played a part in lobbying Whitehall to allow its inclusion in the UDP. Keith Hill MP, Parliamentary Under Secretary at ODPM at the time, was particularly helpful. In this way, progressive political leadership, providing the space and support for the development of innovative policy, is really important to change. I'm the researcher working on these Learning Histories. Thanks for this welcome and interesting perspective on the History of the Merton Rule. Cross-party support seems to be crucial in a number of the Histories featured in the research and the Southampton Learning History has some interesting insights to offer how, in that case, the credit was shared among the different parties. Further there is also a strong theme about risk that is emerging across the innovations charted by the research. And this chimes well with the comments you make about how vital it is to give people freedom to innovate without their being a risk to their professional reputation or career prospects. I am a huge fan of your work! Thank you for developing the Learning History practice and for connecting it to the work of sustainability. I invite you to link with a US website created for folks using action research in support of sustainable enterprise in collaborative communities: www.ARSECC.net...I look forward to collaboration, on line and in person.